So many people talk about boosting productivity, and making the most of their 40 hour work weeks. And yet, outside of the United States, not every country adheres to the “standard” 40 hour work week…which begs the question: should we be working harder, or working smarter? As most people know, the 40 hour work week (and 8 hour day) both have their roots in the industrial revolution, when labor reformists began to push for shorter hours. At the turn of the 19th century, it wasn’t uncommon for some factory workers to be on the job for 16 hours a day, and so the 8 hour work day was quite a relief indeed. While some advances were made during the 1800s by workers who wanted shorter days, the 8 hour work day wasn’t widespread on a global scale until the first half of the 20th century. In fact, it wasn’t until the International Labor Organization held its first conference in 1919 that the 8- or 9-hour work day was somewhat firmly established. In 1938, the Fair Labor Standards Act was passed into law. This established the five-day, 40-hour work week as the American standard for working hours. Elsewhere in the US, some states are switching from a 5 day week to a 4 day week. For example, Iowa’s state employees made just such a move in order to cut energy costs, as have Hawaii and Washington state. 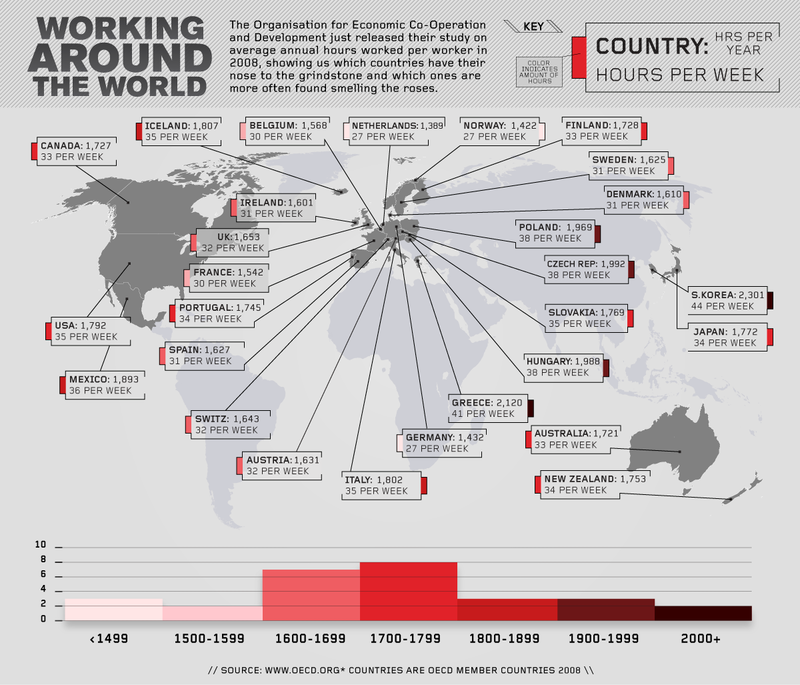 Looking at other countries around the globe, it’s clear to see that the 40 hour work week is anything but standard. For example, the average work week in South Korea is 44 hours, while France has a law that states that 35 hours per week is the maximum allowable. European Union member countries have all agreed to cap the maximum hours worked per week to no more than 48. The work week in the Netherlands and Norway is 27 hours long, while workers in Australia and New Zealand work an averages of 33-34 hours per week. More and more, those Americans who are still employed are working longer hours, either to stay in the good graces of their bosses, or because they are overwhelmed by increased workloads due to layoffs. Either way, it seems like many Americans are working long hours to endear themselves to corporate supervisors, without guaranteeing additional job security. According to Forbes, “To get ahead, a 70-hour work week is the new standard…Just how bad have things gotten? 1.7 million people consider their jobs and their work hours extreme, thanks to globalization, BlackBerries, corporate expectations and their own Type A personalities.” In fact, some experts say that a BlackBerry can extend your working week by as much as 15 hours. While many Americans are just happy to have a job, it seems that during a recession, it is even more important to work smarter, not harder. Long hours do not always equal greater productivity, and indeed it seems that working excessive hours can actually diminish productivity and quality…which is a problem that will affect both the worker and the employer equally.